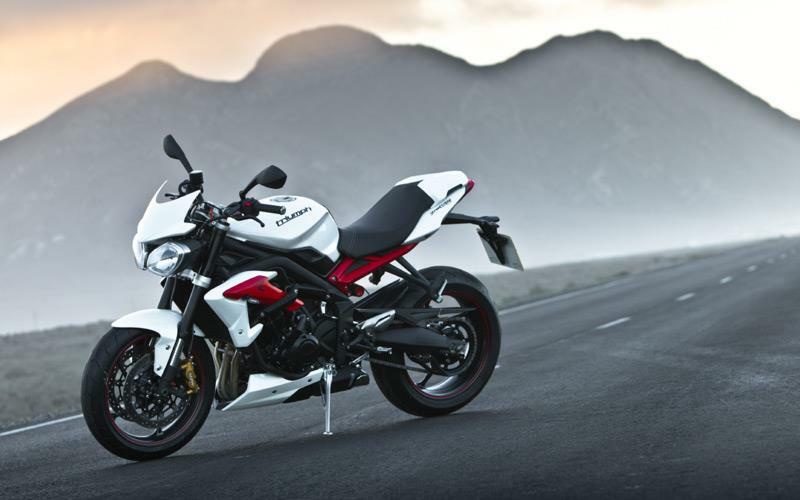 Compared to the previous incarnation, the 2013 Triumph Street Triple R is lighter, smoother, more refined and has the handling and brakes a superbike would be proud of. Best of all, it’s 6kg lighter. It’s lost some of that in-your-face, foaming-at-the-mouth aggression, which made the original make us all stand up and take notice back in 2007, but it’ll be a ‘nicer’ bike to live with. For the first time there’s also an ABS option. It manages to be more of everything: better for newbies, more capable for fast riders, more fun for adrenalin junkies and has one of the best engines and exhaust notes in biking. It’s a great all-rounder, no matter what your ability. 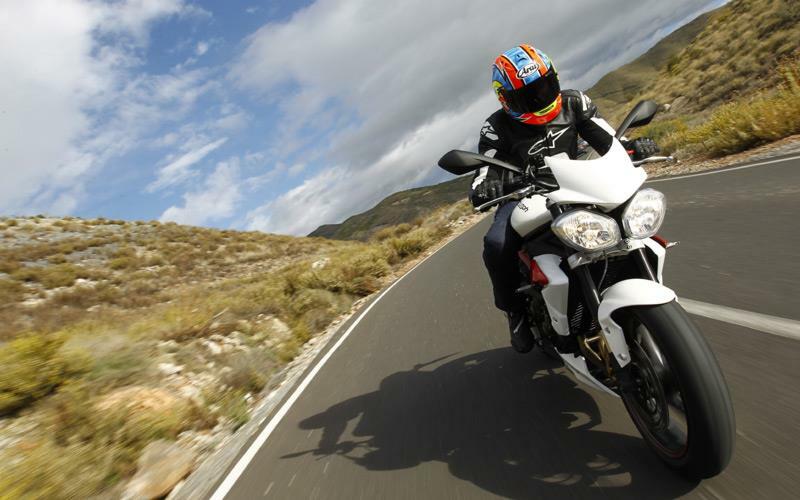 Superb handling, light steering, masses of feel for grip and eye-popping brakes sum-up the Street Triple R’s. It’s not just better than its rivals, it’s one of the best-handling bikes you can buy. A new tubular aluminium frame is now made from fewer component parts (eight, instead of 11) for strength and ease of assembly. It has a bigger steering lock with a 3% better turning circle an adjustable swingarm pivot position. 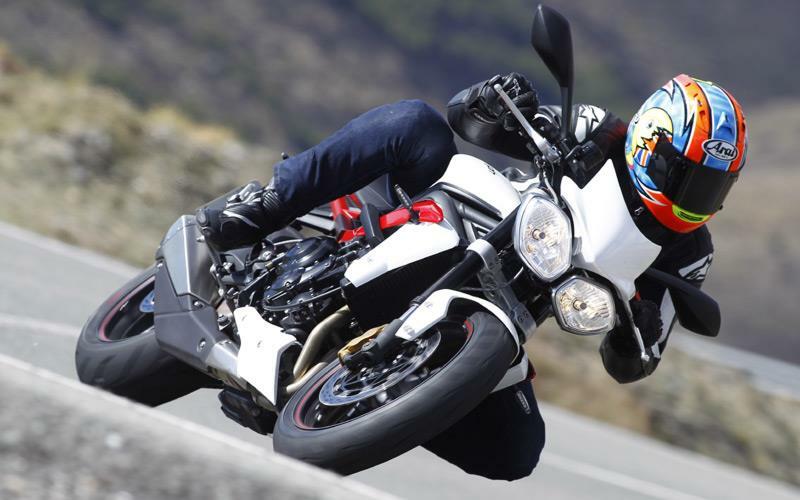 The standard Street Triple has a 4mm higher swingarm position than the R, countering the standard bike’s softer, shorter rear shock and maintaining its fast steering. A high-pressure die-cast subframe is slimmer and lighter than the old fabricated tubular aluminium item. The numberplate hanger can be quickly removed via three screws and a block connector for trackdays. Headlights are moved lower and further in towards the bike. 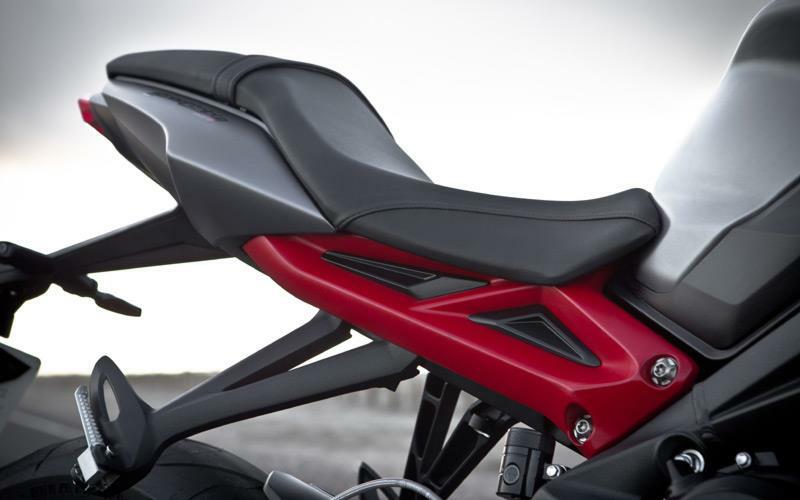 A new one-piece cast aluminum swingarm is 0.6kg lighter than before. Fully-adjustable 41mm Kayaba forks have new top caps and revised damping settings. Weight distribution is now more front-biased, moving from a 49/51 front/rear split to 52/48. The steering angle is revised with rake reduced from 23.9° to 23.4° and trail up from 92.4mm to 95mm. 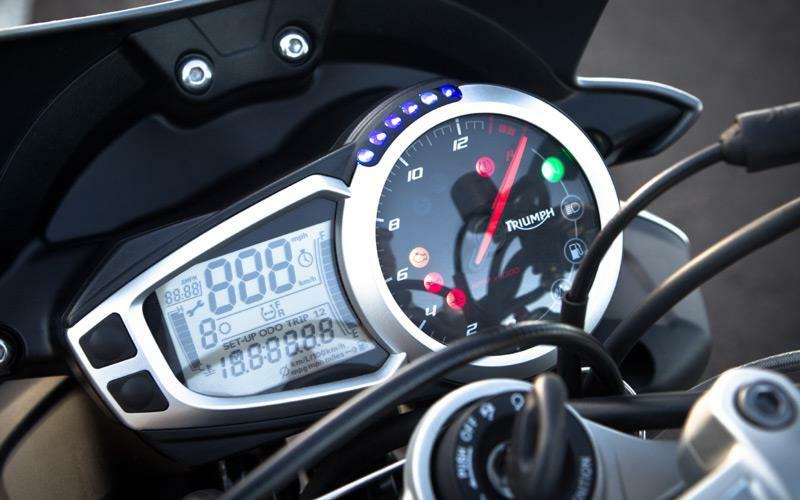 Restyled wheels can be fitted with Triumph’s optional Tyre Pressure Monitoring System (TPMS). 120/70 x 17 front and 180/55 x 17 rear tyres are sticky Pirelli Diablo Rosso Corsa. Switchable Nissin ABS brakes are available available for the first time – the whole system weighs just 1.5kg. Front Brembo disc diameter is up from 308mm to 310mm and the rear disc and Brembo caliper are lighter. ‘R’ version has Nissin four-piston radial calipers at the front and the standard version has non-radial, twin-piston sliding calipers. Making 105bhp at 11850rpm and 50flb at 9750rpm, power and torque remain the same as before, but there are new fuel-injection throttle bodies, ECU settings and a revised first gear, which is longer – but it takes away some of the Street Triple R’s wheelie-inducing acceleration. Triumph says these changes improve fuel consumption by 30% at town speeds and 12% at 50mph. The mpg is the same as before when you’re going for it. The most visual change to the new bike is the repositioning of the exhaust. The two underseat pipes have been replaced by a single, more conventional side-mounted system. 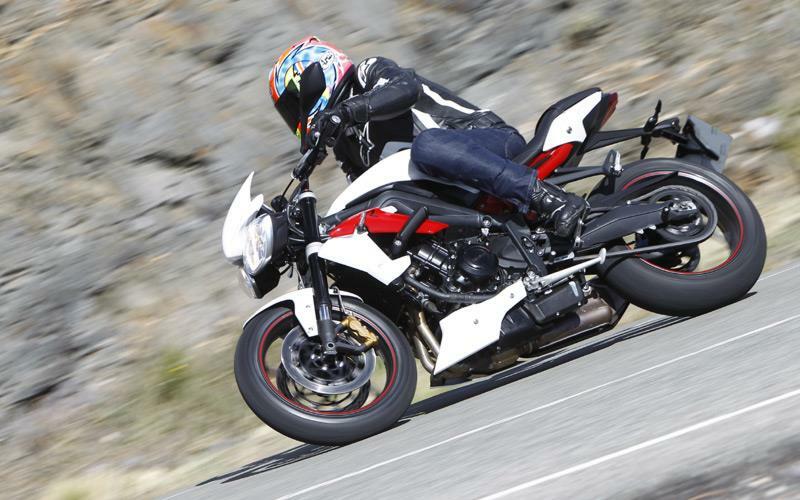 The new exhaust, which Triumph says has a deeper sound, saves a useful 3.6kg in weight. Lots of versions of the exhaust were tested during development to ensure decent ground-clearance at full lean. 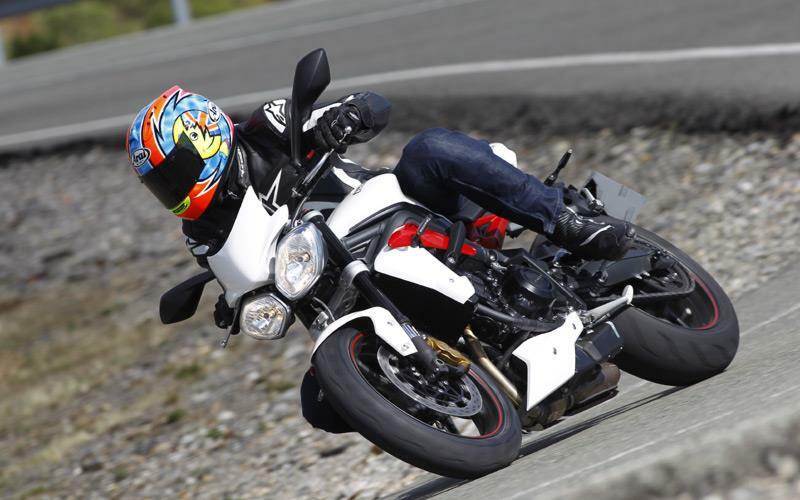 The previous Street Triple has proved to be robust and reliable. You can see it’s been built down to a price in a few areas, but it’s a sub eight-grand bike when new, after all. You don’t have to pay a lot for all this performance, handling, stopping power and fun. It’s great value for money. Aside from the option of ABS, the Street Triple R doesn’t come with any electronic riding aids, but to be honest, it doesn’t need them. But you get fully-adjustable suspension, radial brakes, a multi-function dash and wide range of official Triumph accessories available to buy. These include things like Arrow exhaust cans, crash protection, heated grips and an alarm. 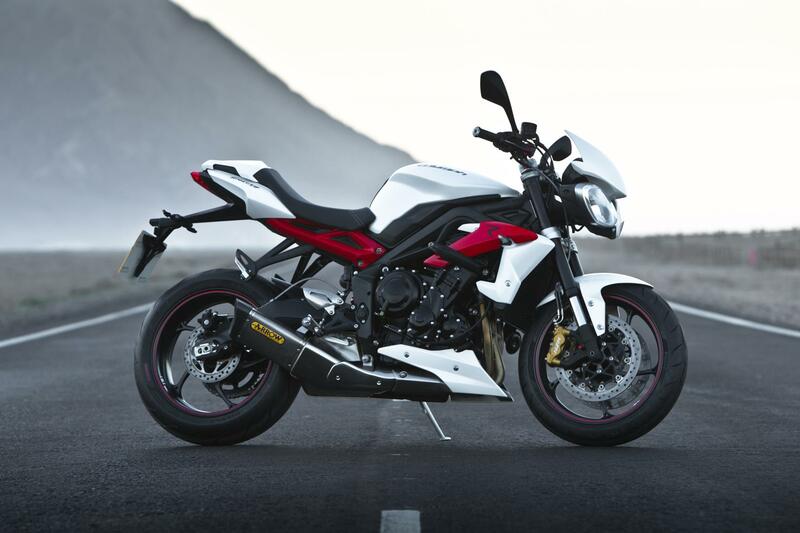 2011 – Street Triple and Street Triple R facelifted. Detail changes and new angular headlights. 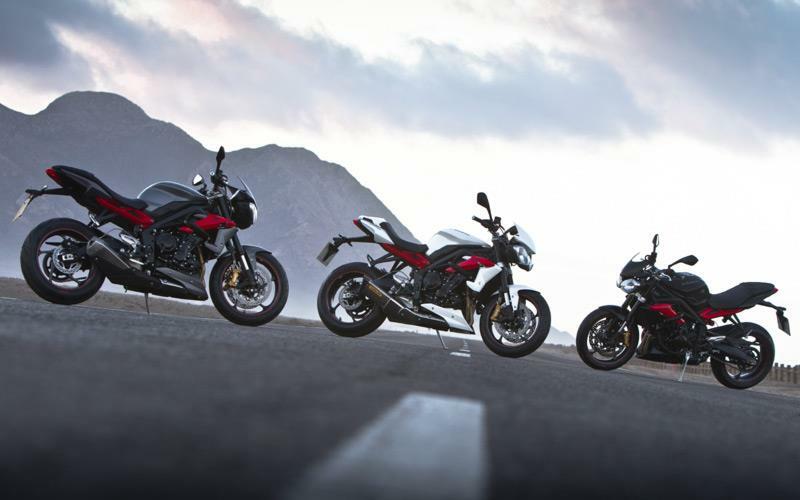 10 owners have reviewed their TRIUMPH STREET TRIPLE R (2013-on) and rated it in a number of areas. Read what they have to say and what they like and dislike about the bike below. Really a very good mid-level road bike that will handle in real world situation better than most sportsbikes, usable everyday and fun enough for a weekend blast. Lovely firm confidence inspiring suspension, chassis handles very well indeed, a little flighty at very high speeds but perfect for B road scratching, brakes are fine. Lovely torque at all most rpm, very low is lacking slightly and top end is a little gutless, very linear and predictable power, engine braking is good as well. They suffer terribly when exposed to salt. Triumph servicing costs aren't great and short valve intervals on this bike. Comfortable enough, quickshifter is well worth having. Bought from a used dealer paid 6500, when the bike was 3 years old and had 3k on the clock. Very poor throttle response (jerky, unrefined), build quality seems poor. Customer service seriously lacking. given the throttle issue, it's never much fun to drive. Fine at high speed on a motorway, but you can't city drive or enjoy it on a back road with any confidence. There is a lot of power in this, but delivery is a little disappointing. Haven't had it long enough - cost about 250EUR to get a brake caliper replaced if that's any indication. Simply one of the best naked 600 class bikes out there. Best sub litre bike I have ridden. Previous bikes include RR9 Fireblade, GSXR1000 K3 & K5, 5JJ R1, RSV Mille R. First time out on a 15 demo it felt like a BMX with an engine! Plenty of grunt and the ability to hang on to a gear until over 12k where the Speed Triple 955 and 1050 ran out of steam at just over 10k. Easily stays with other 600's on the straight and in the corners and the only down side is to be perfect it would need a little suspension tuning. I've sourced and fitted a Daytona R Ohlins rear shock which shows up the forks deficiencies. Not sure what Triumph were thinking on the suspension as it seems to be sprung differently at both ends. Hard to set up the preload correctly due to weird spring choice. Brakes are amazing although never had a bad Triumph on the Brakes. Without a doubt a superb engine with plenty of stomp and very flexible due to the triple torque. Mine is never ridden in poor conditions unless caught out and is kept clean and dry in a brick built garage and treated with ACF-50 but I would have no issues recommending the product to anyone concerned with Triumph build quality. I have heard stories of lose bolts and electrical gremlins but so far haven't suffered with anything similar. Slightly thirsty at 38-42mpg and although I'm not a fool I do tend to wind it up quite often. Diablo Rosso Corsas as standard but at the price of more neutral, slightly slower steering, throw some Metzeler M7RRs on it which are brilliant in the wet or dry. DRCs tend to pick up punctures quite easily. If you've come from a sports bike source a set of Daytona rearsets to get your feet back a little further. Speed Triple 11-16 throttle tube is a good choice for around a tenner for a shorter turn to wide open throttle. The bike badly needs a rad guard due to the short front mudguard. Purchased used from Bevans Triumph in Cardiff who were ok to deal with although they offered no extras not even a new tyre which it needed. Is this the best naked middleweight? I think it probably is. Taut, narrow, sharp, precise, stable, predictable, almost telepathic handling. Eye the 2" piece of tarmac you want at the apex, simply hold that thought and she puts you right there, every time. The upright yet somewhat aggressive forward leaning ergonomics give a great blend of comfort, vision, low speed control combined with a posture that begs the rider to work the bike a bit harder through the wiggly bits. Very easy to move around on the bike without upsetting stability. Comfort wise, done a couple of 7 hour stints and was up for more when I headed back home. Very easy in traffic, parking and moving around. This bike can commute, tour, track and weekend blast. The lack of fairing makes prolonged higher speed riding more tiring. The upside being a reduced temptation to be the wrong side of the national speed limits. Can't imagine how ruined my neck would be after 130mph for an hour on a German autobahn. Pillion experiences have not been great. Poor lass slid around a lot and didn't feel too stable. Two up also made the back end feel saggy and non compliant, a bit of preload adjustment and clicking should sort it though. Brakes are eye-wateringly responsive, up there with the superbikes and give tons of feedback. The overall handling of this bike is fantastic and comes into it's own on meandering, well surfaced A roads. One of the quickest bikes around through the twisty bits. Confidence inspiring for newer riders and amazingly good fun for the more experienced. Top notch! Oodles of torque throughout the entire rev range building very linear power delivery as the revs climb, and she loves to rev. Throttle response is instant, smooth and predictable with no stutter or jerkiness except at very low 1st gear speeds in traffic. Gearbox is silky smooth on the move and forgives any clumsiness but can get a bit sticky when static. I've had a few occasions when shifting to neutral or 1st at a standstill is a minor nuisance. The Triumph Street Triple R is a beautifully crafted and well presented motorcycle. Some components, for example the mirrors, are a bit cheap and fitted to help keep the bike affordable. General build quality and finish are excellent. I really like the textured matte finish of the frame and swingarm with cool little shiny flecks embedded in the finish. The components look well thought-out and have a nice finish to them. I can't comment on reliability as I have done just 2000 miles trouble free miles since taking ownership 5 weeks ago. Insurance is reasonable for this machine. I've been pleasantly surprised by the fuel consumption. I usually ride her for 3 to 7 hours on varied A-roads and better B-roads observing speed limits on straight sections instead seeking out twisty bits where I give her the beans. So far she's been returning 55-57 mph. I check fuel economy on every refill and calculations have always agreed with the bike's computer. I'll run decent Pirelli's on her, that's going to add up over my typical 12,000 annual miles. I bought this bike at 1 year old with one owner, in terms of value for money I'd rate this bike as excellent. You get a lot of motorcycle for your cash. The bike comes with sports Pirellis that really work well with this bike giving smooth, quick corner entry with lots of grip and feedback. The instruments are quite nice with an easy to operate multi-function computer. The funky blue gear change lights a cool if you like that sort of thing. Digital speedo is very easy to read as if the analogue tacho. Gear position indicator and fuel gauge are nice to have. I haven't fiddled with the fully adjustable forks and shocks yet but wonder whether rebound/comp setting will offer much real adjustment since they top drawer equipment. Time and twiddling will tell. Much of the rest is pretty standard fair that works well enough. The mirrors are pretty awful, very little adjustment, move about at higher speeds and obscured by elbows. A glance won't do you need to move your head quite a bit to get a decent view, easily changeable for prettier one that don't look like MM's ears. 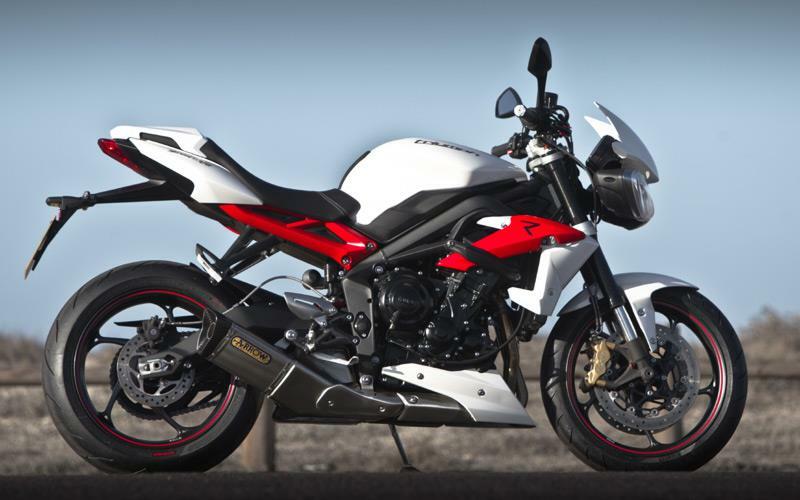 Well, I rode many bikes & multiple varieties & styles to make sure that the Street Triple R was exactly what I wanted. Yamaha FZ-09, Ducati Panigale 899, Suzuki GSX-R750, all spent time with me. But, at the end of the day, I could not find better ergos, a better ride, more flickability, nor a better connection better bike & rider. I've ridden over 3,000 miles in a month and 1/2 & love it more than when I first got it! As my riding skills improve, and, my confidence increases, I find that the bike has been waiting for me to get there! An always willing partner, ready for the next curve, I find that the build quality is exceptional, the mechanicals are very robust, the balance is perfect and 'stock' exceeds expectations! Very forgiving, yet, surgical instrument precise in any manuever- it's light weight deceives due to the great ride control from the adjustable suspesion. Brakes that can stop time & warp space and acceleration that piles on revs almost out of control over 6,000 RPM's. Yet, between 3,500 - 6,000 RPM's it is very docile, allowing even a newer rider to develop skills easily & gain confidence over time. 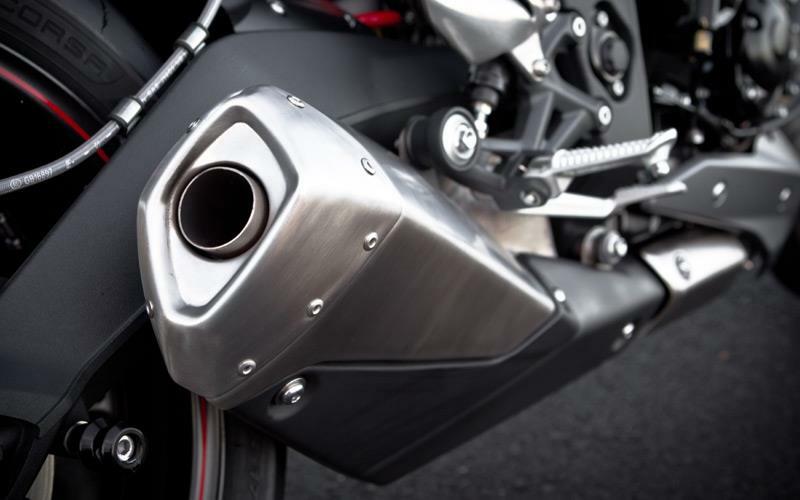 The exhaust note is enjoyable, until the throttle is cranked wide open, where it growls with a mixture of intake, valve whir & an oly 3 cylider exhaust sound creates pleasure & an adrenyline rush- every time, without fail. Who cares what it looks like? Naked- so what? "Beaker" headlights with a Fly Screen cap?- they shine wide & far. I can never see the bike while I ride, and, the ride is so outstanding- I can barely see the bike when I get off of it. If it's about the ride, and, you aren't making a statement, try it- nothing else even comes close. Promise. What can be said about this bike that hasnt been said already??? Just traded in a sprint st1050 and can honestly say no noticable loss in power, despite being smaller engine the lack of weight means the bike picks up speed so rapidly, even in 6th at 30mph! the only down side is that I had no extras on the bike, but that can be a work in progress. This my third Street Triple. I bought a new 2013 model three months ago. The bike has left me stranded twice with immobiliser issues. Now all the electrics have been changed by the dealer, so will see what happens but have zero confidence in the brand now; very disappointing. Would be unlikely to buy Triumph again sadly. Have it for about 1500 miles now. I enjoy every minute. Shame the tires are more suited for dry and warm condition and it shame to swap brand new for something more wet-reliable but overall bike is a spot on. Very good acceleration and handling like a dream. I don't think there is any bike within range of class and/or money which can be competition to STR.